The following materials are available to you to help spread the word about the ShakeOut (and encourage people to join). These web banners are shown to scale except when noted. 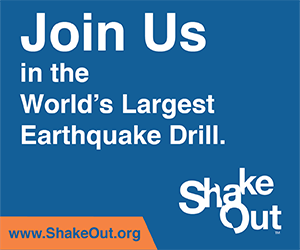 Web banner images for promoting the ShakeOut Worldwide (not for a particular region). To Download: Right-click (or Control+Click on Mac) on the image then click "Save Image As..."